Our Mission is To Promote and Advance Education, Interest and Participation in the Visual Arts. Our Vision is To Serve Individual Artists of All Ages and Skill Levels Along Their Creative Journeys and Providing Opportunities for The Community to Imagine, Discover & Create. The Naples Art Association welcomes visitors to a variety of exhibitions and strives to provide an educational opportunity for a broad range of learning experiences. Each show has its own focus, sharing unique stories and facts about artists, their style and the context of contemporary artwork. Art appreciators will find our galleries filled with art by international, national and local artists, young artists, members’ exhibitions, new art trends, community partnerships and much more. Exhibitions are on view year-round at the Naples Art Association, Physicians Regional Healthcare System, plus even more popup gallery opportunities, such as the fall to winter show at Naples City Hall of artwork by students in ARTScool. Naples is filled with a talented community of artists. In 1954, artists pooled their passion and organized it into the Naples Art Association. Local artist E. George Rogers, a retired accountant committed to art and community volunteerism had the idea for a place where artists could imagine, discover and create. More than that, he wanted to enrich the rest of the growing town of Naples. He joined forces with artist friends Elsie Upham and Grace Lake and together formed the Naples Art Association. The fledgling organization held educational sessions and art exhibitions. Member artists taught art in local schools, donated artwork to local businesses and brought in successful art friends to inspire Naples’ residents and artists alike. Looking back, it's impressive to see how the arts were at the center of expanding Naples into the thriving place it has become. The Naples Art Association is grateful to celebrate its 60th Anniversary as a force for art in the community. The NAA will pay homage to the artists and visionaries who wanted to build a thriving art community and then made it happen. Their efforts have proven to benefit the entire town for decades. Naples Art Association - All About Kids! Naples Art Association believes that a strong arts education is part of the foundation for a successful future. Youth who participate in the popular ARTScool summer education program delve into their creative sides, and they also have an opportunity as they get older to gain work experience as a volunteer intern. Special studio art classes for children are offered throughout the year as well. Collier County high school art students have opportunities to earn scholarships to pursue their artistic studies at the collegiate level. Since 1957 Art in the Park has remained the monthly members show showcasing the talents of our member artists. Believed to be the first outdoor art show held in Naples, Art in the Park carries on the tradition of providing our community access to the very creative fine art and craftwork of our member artists. The Naples Art Association is proud to host this juried art show held on the first Saturday of each month from November through April, 10am-4pm Art in the Park is held in conjunction with “First Saturday” an event directed toward children. Children of all ages will have the opportunity to experience working in many mediums, expanding their creativity. Membership in the Naples Art Association is the easiest way to support the arts. Your membership gives you access to exhibitions, art classes and workshops, lectures and special events plus members only opportunities. In addition, you can feel confident that you are helping to support programming provided by the Naples Art Association, a 501(c)3 nonprofit organization devoted to fine arts exhibition and education in your community. Additionally, your donation supports youth and college scholarships for art education, outreach programs for at risk children in our community, and professional development access for emerging artists. You can leverage the impact your dollars make by supporting the Naples Art Association. The arts are a major force driving the development of our cultural legacy, educational success and economic development. Art enrichment is no longer a luxury; rather, art enrichment is essential to developing creative thinkers who can solve the problems of tomorrow and develop new ideas and methods to build the future. Art integration lubricates the mind to take on the unknown or misunderstood by freeing us to see things from a different angle. Programming provided by the Naples Art Association will continue to enrich our lives and expands our view of the world. Your support ensures future generations the ability to Imagine, Discover and Create. All new volunteers meet with the Volunteer Coordinator for a personal orientation. At this meeting volunteer’s tour the facility, meet the staff and hear about the multitude of volunteer opportunities available to meet your talent and skill level. Volunteering shows your dedication to the arts and is a fun & rewarding way to give back to your community. Now celebrating its 60th anniversary, Naples Art Association is reconnecting with its history, promoting the value of art education and emphasizing the impact the arts have on the economic development of our community. 60 years ago, E.George Rogers, Elsie Upham and Grace Lake founded the Naples Art Association with 34 other artists. They created art, exhibited and taught in and around the community using different venues as their platform to promote the local artist. Many of the members volunteered to teach art in the local schools until the public school’s art program was established in 1956. In 1957, the Naples Art Association organized the first “Art in the Park.” Still running today, it’s thought to be Naples’ oldest outdoor art show. In the 1970s, the group collected funds to restore The Naples Depot. There they built art studio spaces and held the group’s first art exhibition in 1978. The following year, the organization began to offer adult art classes. They continued providing educational programs in that facility until 1998. In 1980, their first annual spring art show was held in Cambier Park. As its known now, the Naples National Art Festival has become the association’s largest fund raiser and is rated among the top 10 art festivals in the country by Sunshine Artist Magazine. 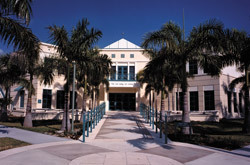 In 1992, the Association began meeting with the Naples City Council for a lease agreement to provide 8,000 square feet of public land in Cambier Park to build a community art center. In 1995, leaders signed an agreement and raised $3.5 million through private donations, including one from Suzanne and William von Liebig for whom the art center is named. On November 22, 1998, the Naples Art Association officially opened. The 16,000 square foot, two-story facility features six studios, a main exhibition hall, rounds galleries, one of the area’s largest art resource libraries and a gift shop. Today, the art association’s primary goal is to serve as a working art center where the community can access art education, activities and events for all ages and learn about art through exhibitions and educational outreach. We encourage you to join us by investing in the arts and, in turn, in our community. 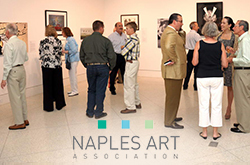 The Naples Art Association, is the ideal place to host your next gathering or event. Located one block south of historic Fifth Ave South, the building overlooks beautiful Cambier Park. From social club gatherings, reunions, corporate meetings, special celebrations or weddings our expert staff will assist in all you’re planning needs.